Joel's Jottings: Sand is fine. I am not. 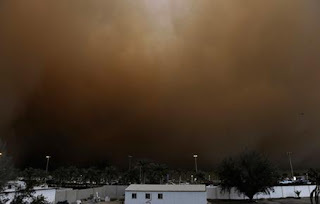 The dust that the sandstorm from Kuwait brought with it, on Friday night, had sneaked very swiftly and promptly into all nooks and crannies of my house. Even though I did my best to secure all windows and doors as soon as the wind started, these tiny, creepy, slippery, slithery, unkindly particles of dust laid themselves into thick layers on our sofas, table-tops, shelves and floors. When I went down to see my car on Saturday morning, it was also clothed in an attire of such deep dark brown colour, that I had to pay extra to the man who washed my car. I also heard, from your newspaper, that the doctors had to treat dozens of people who went to them with dust-related complaints. I have now, therefore, come to a firm conclusion that this sandstorm has been specially imported by house-cleaners, car-washers, and medical doctors to make an extra buck, through a wicked multi-national conspiracy. 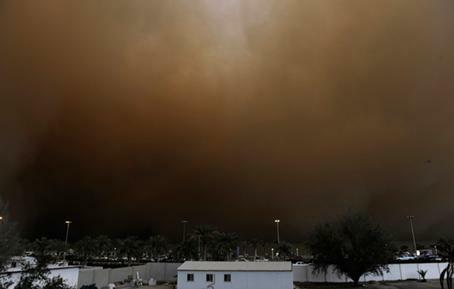 There is an immediate need for sandstorms — and those importing them — to be strictly warned against further infiltrations like this, and also a grave need for the government to also consider putting up a dust embargo, on neighbouring regions. This dust-to-dust free-trade imbalance should not be tolerated.